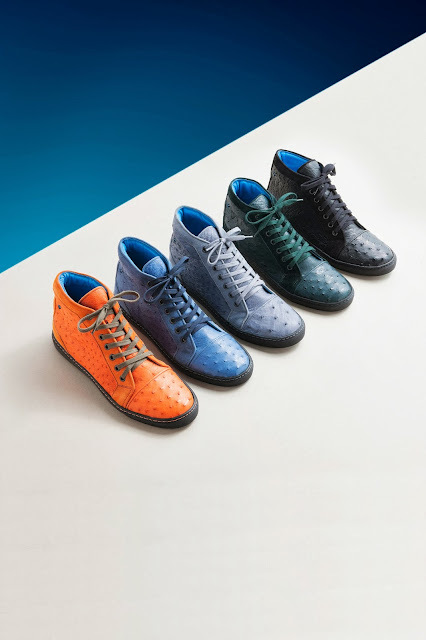 The launch of his collection, brand new for Autumn/ Winter 2013, presents a prestige line of Italian-made, hand-crafted shoes in simple, comfortable styles made from the best quality exotic skins. The sophisticated, limited edition shoes come in two styles for men and two for women: a timeless, low-heeled, leather-soled smoking slipper in ostrich with metal mesh tassel and a high-top sneaker in suede and ostrich on a slim-line black rubber sole. Both can be dressed up or dressed down and should be on your wishlist, they are mine.